A long day in DC yesterday, making the formal public announcement of The Overview Institute, an organization aimed exploring the ramifications, implications, and the possibilities for changes in perceptual and consciousness that arise (as it were) from our ability to rise from our planet. The Institute is named, and its concerns and avenues of inquiry and speculation flow from, the exemplary work of Frank White, whose The Overview Effect: Space Exploration and Human Evolution marked, upon its publication in 1987, the first sustained and consistent attempt to examine how human perception is altered (and perhaps transformed) by off-Earth experience. Frank's book was of (groundbreaking) necessity anecdotal -- reminiscences, accounts, insights from individuals who'd been to space, all of them at the time astronauts or cosmonauts. To those anecdotes Frank brought and brings his sharp analytical intelligence and clear, focused thinking. An indispensable book, and one that has refused to release its hold upon the imaginations and scientific curiosity of those who've read it. Twenty-one years later and the handful of people who's been off-planet in 1987 has now swelled to more than 500, a number that will itself grow dramatically as various private-enterprise human space transport enterprises come on-line over the next few years. At yesterday's event we unveiled our Institute's Declaration of Vision and Principles as well the other members of the Institute's Core Overview Group. Most importantly, we called for others to sign our declaration, and join us in exploring the issues, opportunities, and areas of scientific, cultural, artistic, spiritual, philosophical inquiry raised by the Effect's effects. 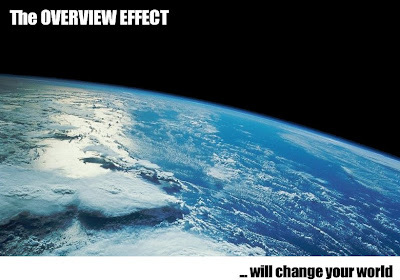 As Frank pointed out in his eloquent remarks, the Overview Institute doesn't have an ideology or agenda -- the implication of his work and findings is that 500, or 500,000, or 500,000,00 people experiencing the effect in orbit might well manifest 500,000,000 different personal responses to and manifestations of the experience. What we're hoping to apply quantitative scientific methodology to is whether or not the Effect itself exerts measurable neurophysiological/cognitive effects on the brain. But we're also quite deliberately seeking to engage the vision of artists from all media, cultural and thought leaders, activists, and above all interested individuals of whatever stripe and profession in exploring the question of just what space means -- and can mean -- to and for us here on Earth. "Are we poised for a philosophical launch?" As I said yesterday, and believe, "Now we are." And tell others about it.